On this day, the great St. Macarius, the son of Basilidis the Chancellor, was martyred. When the messengers reviewed the order of Emperor Diocletian, which dictates the worship of idols, with Macarius, he did not heed them. When the Emperor knew that, he sent Macarius to the governor of Alexandria. He bid farewell to his mother, and asked her to care for the poor and the needy, then he went with the envoy. The Lord Christ appeared to him in a vision, encouraged him, and told him what would happen to him. When he arrived to the city of Alexandria, he stood before Armanius the governor, who deceitfully treated him well because he knew that he was the son of Basilidis the Chancellor. On the 24th of Abib, St. Abanoub was martyred. He was born in the city of Nehisa (District of Talkha). His parents were pure and merciful and they reared him in the fear of God. 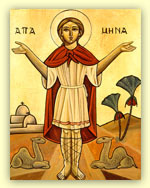 When he was martyred by the Roman rule, Diocletian, who incited the persecution against the Christian, St. Abanoub was twelve years old, and he desired to shed his blood for the Name of Christ. On July 31 our Church celebrates his death, as the day of his birth into eternal life. Abanoub's relics, as well as the relics of many Christians who died with him, are still preserved in St. Virgin Mary and St. Abanoub church in Samanoud. It is also said that the Holy Family visited that place during their Flight into Egypt. The church still contains the well from which The Lord Jesus, St. Mary, and St. Joseph drank. Numerous apparitions and miracles do occur in that church until this very day. Abanoub was born in a town called Nehisa in the Nile Delta. He was the only son of good Christian parents who died when he was a young child. At age twelve Abanoub entered the church to hear the priest asking the congregation to remain faithful during the persecutions provoked by Diocletian, the Roman emperor. On the 23rd day of Abib is the commemoration of the mart yrdom of the blessed St. Marina, who overcame the Devil. She was one of the daughters of the nobles of Antioch. Her parents were pagan. When her mother died, her father sent her to a nanny to raise her, who was a Christian. She taught Marina the Faith of Christ. When Marina reached the age of fifteen years, her father died. One day she heard her nurse talking about the biography of the martyrs and what glory they receive in the Kingdom of Heaven. She longed to become a martyr in the Name of the Lord Christ. 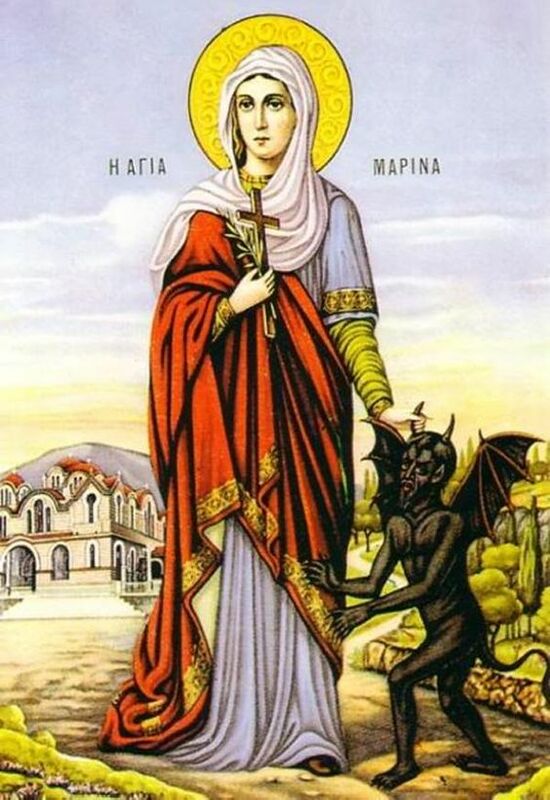 One day St. Marina went out of her house with her maiden servants, and on her way she passed by Lopharius Ebrotus, the governor, who admired her much when he saw her. He ordered her brought to him. When the soldiers came to her, she told them that she was Christian. In turn, when they told the governor this, he was distressed for he liked her, and he had her brought to him by force. He offered her the worship of the idols and asked her to forsake God, but she refused. www.the2Fish.com , is a website (mobile applications included) operating under the supervision of Father Dawod Lamey and Father Markos Fawzy. The main aim of the service is to evangelise and reach the huge audience that is present online almost every day. Once you join, you will get an orientation and introduction to the service so you can understand everything. Read more: THE 2 FISH!